Court Ladies Preparing Newly Woven Silk, original painting by Zhang Xuan (713–755). The only surviving copy was made in ink and color on silk by the Emperor Huizong of Song (1082–1135). Image courtesy of the China Online Museum. 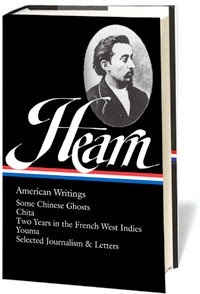 Lafcadio Hearn had, by any measure, an unusual childhood, which was followed by an equally singular career as a writer. He was born Patrick Lafcadio Tessima Carlos Hearn to a Greek mother and an Irish father on the Ionian island of Lefkada, abandoned by his parents to the care of a great-aunt in Dublin, packed off by a guardian to a Catholic boarding school in France at the age of twelve, and then educated at a preparatory school in England, where a playground mishap resulted in the complete loss of vision in his left eye. In 1869, at the age of nineteen, his guardian sent him penniless to the United States, where he eventually became a journalist in Cincinnati and, later, New Orleans. He remained in the United States, with a two-year stint in the West Indies, until 1890, when he emigrated to Japan. During the last fourteen years of his life, he gained fame both in Japan and the West as an interpreter of Japanese culture, and the Lafcadio Hearn Memorial Museum, founded in 1933, remains one of the Chūgoku region’s most popular tourist attractions to this day. Throughout his life Hearn was fascinated by artefacts and legends from all over the world. In 1884, while living in New Orleans, he published Stray Leaves from Strange Literature, a collection of folk tales adapted from Egyptian, Arabic, Polynesian, and other traditions. The following year he wrote “The Legend of Tchi-Niu” for Harper’s Bazaar (or Bazar, as it was then spelled). Over the next two years he completed several other tales and included them in Some Chinese Ghosts. “There are only six little stories,” Hearn wrote to the musicologist Henry Edward Krehbiel, to whom he dedicated the book, “but each of them cost months of hard work and study.” Hearn’s preface to the volume notes, “In preparing the legends I sought especially weird beauty,” and an appendix explains that “The Legend of Tchi-Niu” is his own elaboration of a story culled from a single paragraph in a French translation of the Kan-ing-p’ien (“Book of Reward and Punishments”)—then mistakenly attributed to the Lao-tzu, the author of the Tao Te Ching. Here is Hearn living in New Orleans, with not a jot of direct experience of Asia, confidently reworking Chinese legends. . . . These six precocious tales, a foretaste of Hearn’s later life in Japan, are really about the miracle of artistic invention, which was on Hearn’s mind as he struggled to make the transition from life as a hardworking journalist to that of a novelist and writer of exotic tales he has gathered from a multitude of scholarly sources. In the quaint commentary accompanying the text of that holy book of Lao-tseu called Kan-ing-p’ien may be found a little story so old that the name of the one who first told it has been forgotten for a thousand years, yet so beautiful that it lives still in the memory of four hundred millions of people, like a prayer that, once learned, is forever remembered. . . . If you don't see the full selection below, click here (PDF) or click here (Google Docs) to read it—free! What an exquisite story! Thank you for sharing this, and bringing Lafcadio Hearn's Chinese Legends to my attention.